The publisher provides its inventory to an Ad Exchange, who is responsible for holding an auction, during which the DSPs, on behalf of the advertisers, will place a bid on each impression. The value of the bid is based on the value of that impression, as determined by the advertiser’s parameters with the DSP. The bidding process ensures that each impression is sold at the maximum price, as dictated by real time market demand. The eco system as shown above screen shot has buyer side (DSP) and seller side (SSP), the buyer side has OpenRTB client and sell side has OpenRTB server. For example, when the user (consumer) visits a site, the ad request (with bid) from publisher is send to buyer side and to seller side through OpenRTB medium. The ad response is given from seller side according to bid response received from buyer side, based on the auction the ad will response from seller side to buyer side and finally shown to the user (Consumer). Advertisements are commonly distributed using a platform called ad server and when the platform is integrated with RTB network, it can buy or sell the ads from third-party ad exchanges. The programmatic advertising also implies the same process of enabling the RTB techniques in both advertiser and publisher side to perform automated buying and selling of digital advertisements. The method is followed using a platform called DSP which has the advertiser ads and campaign details of created advertisements. The promoters can bid on the selective ads and purchase it from online ad exchanges. 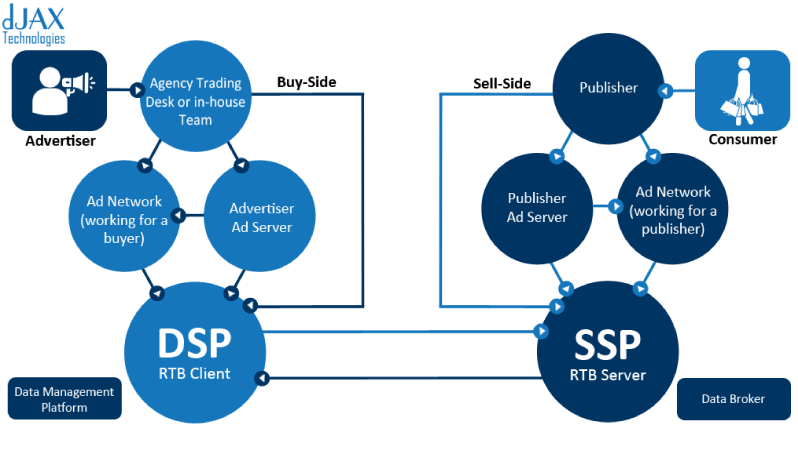 The SSP (Supply Side Platform) technique allows publishers to sell their ad inventories through the ad exchanges. This process of advertising benefits the users to advertise efficiently at the right price and at the right time. The importance of choosing programmatic advertising platform is it can enhance the business development of an organization or a team business. Targeting: When an adserver is enabled with programmatic advertising platform, it can monitor the demographic change, browsing behavior and interests of a particular customer and deliver related advertisements on real time. The targeting feature can work seamlessly across various devices and deliver the ads automatically. Retargeting: The retargeting or remarketing can target a specific customer who had made a conversion on the advertiser ads. This feature places a cookie on the customer browser and publishes the ads by capturing the browsing data. Insight generation: The programmatic campaign is efficient to avoid fraudulent traffic and low quality advertisements during ad delivery. Advertisements are published based on the performance, visibility and brand security of each advertiser and publisher. Stages of development: The project development involves in designing, coding, implementation, testing, and maintenance. In all steps, the professional developers are involved in producing an expected output. Our clients are updated at regular intervals to understand the progress of the ad server development.